The city is ready to demolish some 2,500 houses deemed threats to public safety because of damage from Hurricane Katrina, but opponents said Saturday they will sue to stop the work to make sure homeowners' rights are respected. Only about 2,500 red-tagged houses that pose an imminent public hazard will be demolished in the next few weeks. The remaining 3,000 will get a second inspection. City officials are trying to locate homeowners to alert them in case they want to remove any belongings before the demolition, he said. However, a coalition of individuals and groups announced Saturday that they're preparing to file a lawsuit to block the city from bulldozing houses without legal due process. "The city of New Orleans knows full well that they are bound by the constitutions of the United States and the state of Louisiana," said Loyola Law School Professor Bill Quigley. "Both constitutions require real prior notice and a meaningful opportunity to be heard before the government can take or destroy anyone's property." The lawsuit likely will be filed this coming week, said Quigley, who, along with the Advancement Project of Washington, D.C., and the Peoples Hurricane Relief Fund is seeking to protect residents' rights. "It is now nearly four months after the damage. No emergency exists that would allow the city to trample the constitutional rights of property owners without due process," he said. 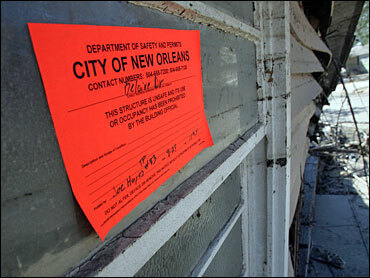 About 68 percent of the city's homes were coded yellow, or sound but with structural damage. Green stickers were placed on houses with little or no damage. The largest concentration of red-tagged houses is in the Lower Ninth Ward, which was inundated when Katrina smashed a wide gap through a levee along the Industrial Canal. The red tags are mostly absent from the city's historic districts, although there are exceptions. City inspectors were deliberately conservative in tagging homes, Meffert said, maintaining that he has not received a single complaint suggesting that a red-tagged house should not be torn down. "If he hasn't heard anything it's because the city stated unequivocally in the past that red tags did not signify impending demolition," said Meg Lousteau, director of the Louisiana Landmarks Society. "If that has changed, they need to make that very clear. Owners of these buildings need to be made aware so they can plead their case or make repairs."